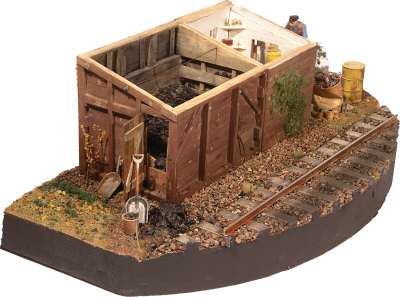 Booklets for indoor layouts and Railroad Gardens. Our main products are Plan-Sets, but we offer many companion illustrated spiral bound construction booklets and a couple DVDs. Our booklets are spiral bound which allows them to lie completely flat when opened and pages wrap all the way around for easy handling, viewing of Plan-Sets and for easy photocopying to be used as templates by the original purchaser. 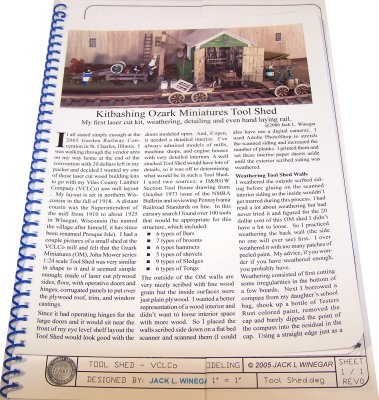 This also allows the modeler to lay this book flat on their workbench. 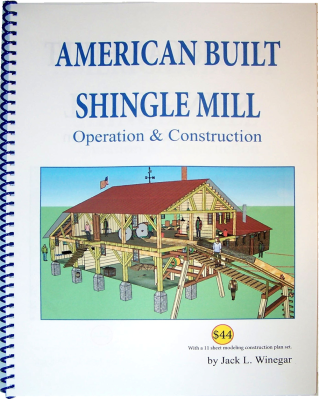 American Built Shingle Mill Booklet with Plan-Set •••• The prototype is a Shingle Mill in northern Wisconsin, but would make an interesting timber frame factory in any industrial complex. 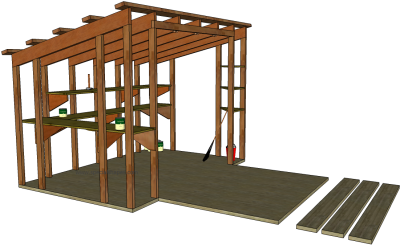 Plan-Set shows prototypical post and beam construction with batten on board siding. 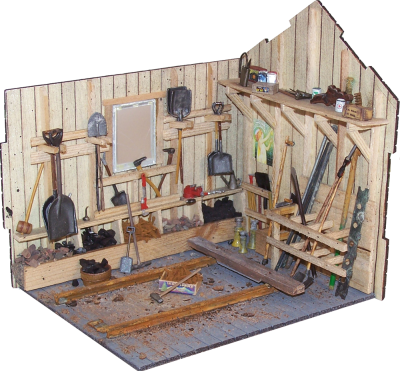 This model would look great as an open sided model to see the optional 100 commercial details listed on our material list or viewed through windows. 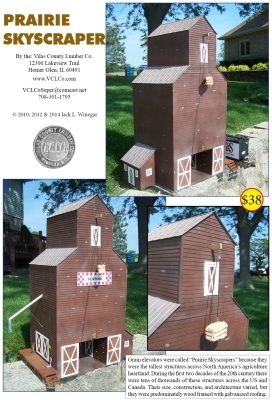 There is an attached Lean-To where shingles were packed, Shipping Shed, a brick Power House and a Jack Ladder. Footprint as designed is 26-5/16ʺ x 17-3/16ʺ with a 17ʺ x 15ʺ “L” Power House. Spiral Bound Booklet •••• consists of 38) 9½ʺ x 13ʺ pages, with over 90 illustrations. Plan-Set includes: 12) 13ʺ x 19ʺ super B fold-out drawings. Plan-Set includes: 12) 13" x 19" super B drawings. Drawings are printed 1ʺ = 1-½ʺ. 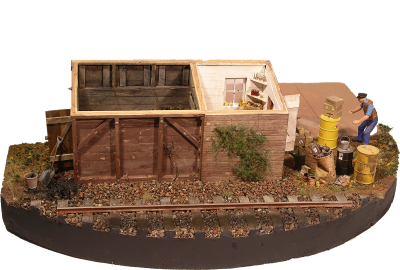 Material lists include milled basswood for an indoor layout, textured patterned styrene for Railroad Gardens, with painting and weathering recommendations. 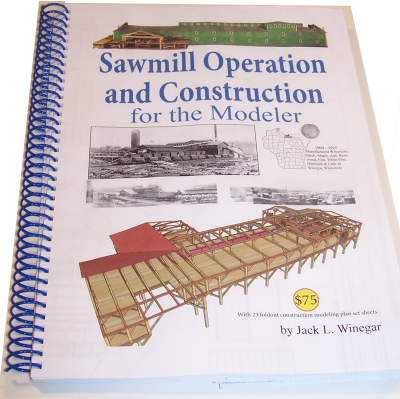 VCLCo Sawmill Book with Plan-Set •••• The prototype of this 3-story mill was state-of-the-art in 1910. (Such mills were still operating into the 1960's with little change.) Because of the vibration inherent to Sawmills operations, wood post and beam construction was the best choice because of its resiliency which caused less wear and tear on all the sawmill equipment. With such vibration it was not uncommon for a mill worker once a week hammering wedges re-tightening the frame to keep the structure sturdy. 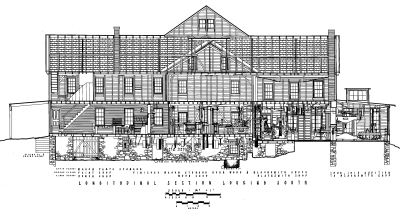 The first story had 12΄ ceiling with a dirt floor with leaking steam pipes, line shafts, pulleys, and clutches running wide belts driving the second story equipment. With the whole first story filled with whirling belts and rotating drive mechanisms, it is hoped the Oiler only had to go down there at lunch time to lubricate bearings when equipment was shut down! Footprint 47ʺ x 87-½ʺ. 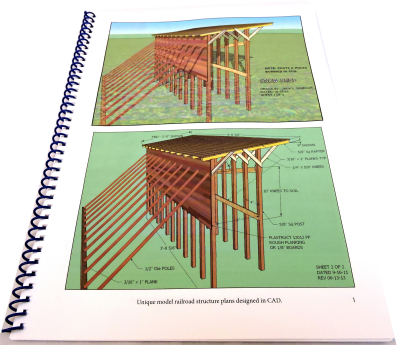 Spiral Bound Book •••• consists of over 134) 9½ʺ x 13ʺ pages, with over 300 illustrations which includes a fold-out Plan-Set of 30) 13ʺ x 19ʺ super B foldout drawings which includes; 5) sheet Side Haul, a Sawmill Complex drawing and Jack Ladder, 14) sheet Sawmill (as described above), 4) sheet Green Chain, a Trestle Platform, a Drying Yard and more with a operation schematic of the Sawmill at the Vilas County Lumber Company in northern Wisconsin. 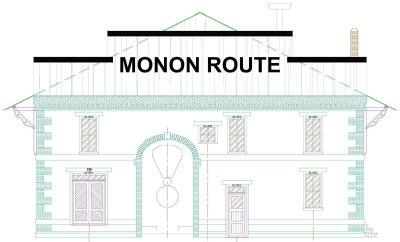 All 1:24 scale Plan-Sets include printing and dimension Scale Conversions.pdf factors to 22 popular scales. 30" Turntable Booklet with Plan-Set •••• This Booklet and Plan-Set is for a 60´ (in 1:24 scale) balanced turntable based on the construction of a turn-of-the-century turntable built by the Lassig Bridge Co. of Chicago, before, and after the Lassig Co. was purchased by the American Bridge Co. Many of these turntables were still in operation in the 1940's. Lassig built such turntables for the Chicago, Rock Island & Pacific, C&NW Ry, Rock Island, and other Railroads at varying lengths. Obviously this design could be easily lengthened for larger engines and tenders. All details are commercially available with styrene shapes just cut to length, from full scale templates in the Plan-Set . Turning can be accomplished by simply turning the Turntable with a couple fingers as was accomplished prototypically by a good man or the Plan-Set gives you the option of using commercial gears. Such turning eliminates fancy electronics, especially if used in a Railroad garden. A front bicycle or tricycle wheel axle bearing is another turning option (which can be found along any street on “Garbage Day”). Or, a simply block core between riveted side girders fastened to a Lazy Susan is another option. Book also includes a Material List, painting, weathering, UV stabilization, and electrical polarity options. 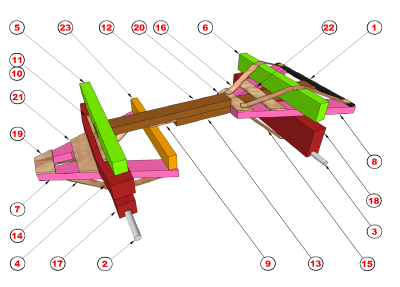 Turntable construction varies. Side girder plates fastened to a block is the easiest, or use styrene shapes riveted to the girder plates for the most skilled finescale modeler, with skill variations in-between. FULL Spiral Bound Booklet •••• This Turntable Booklet consists of 20) 9½" x 13" pages with over 60) pictures and illustrations. FULL Plan-Set includes; 11) 13" x 19" Super B drawings of full scale details. FULL Plan-Set ONLY includes; 11) 13" x 19" Super B drawings of full scale details. Spiral Bound Booklet lite •••• This spiral bound Turntable Booklet consists of; 26) pages with over 60) pictures and illustrations and Plan-Set lite. But the Plan-Set only includes the 4) 13" x 19" Super B full scale drawings used for templates. The other seven (7) Plan-Set drawings are 9½" x 13" included within the Booklet. 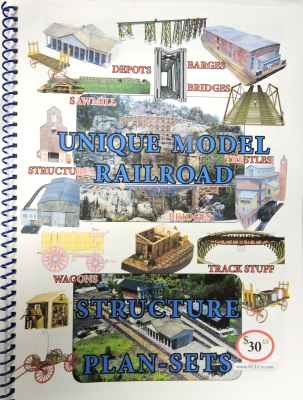 Click VCLCo Unique Model RR Structures Catalog revised January 15, 2018, to view and/or download this large formatted 9½ʺ x 13ʺ .pdf 23 page alphabetical lite version of our catalog of over 100, mostly 1:24 scale Plan-Sets (a few 1", 7/8" G, F, #1, O and HO scale Plan-Sets) shown on this site. 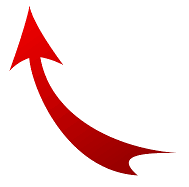 Be patient, this is a large file (4.6 MB). A 44 page spiral bound hard copy will be eMailed free or mailed USPS free for $25. This 44 page version has more illustrations and includes our list of Booklets than the .pdf downloaded version. Both versions list the same Plan-Sets. 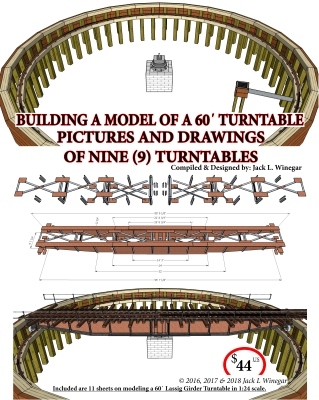 Building and Modeling the American Farm Wagon and a few other Horse Drawn Vehicles Book with Plans •••• This spiral bound book contains 216) 9½ʺ x 13ʺ pages of 70# paper (Book weighs almost 3 lbs. 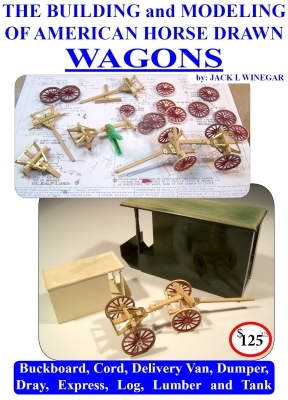 ), with over 700 illustrations, pictures and drawings to build 12) American Wagons and 2) carts. 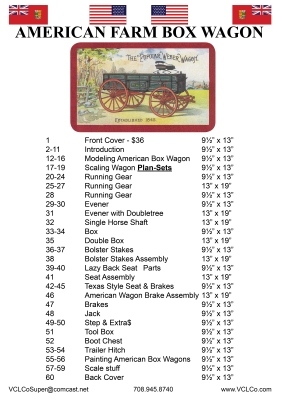 Building an American Farm Box Wagon Booklet with Plan-Set ONLY •••• This spiral bound booklet contains 51) 9½ʺ x 13ʺ pages plus 9) 13" x 19ʺ super B drawings, for modeling an American Farm Box Wagon ONLY. 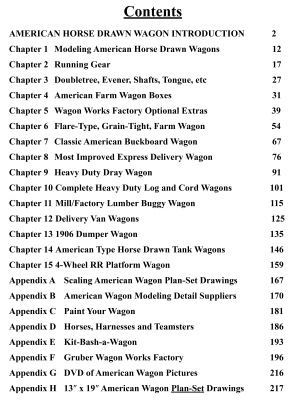 Modeling an American Farm Box Wagon includes: Introduction • Scaling wagon plans into other scales • Painting American Farm Box Wagons • Running Gear • Eveners • Single Horse Shaft • Seats • Step • Tool Box • Trailer Hitch • Brakes • Double Tree • Bolster Stakes • Boot Chest • Farm Wagon Boxes. 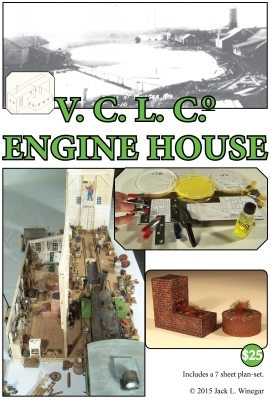 VCLCo Engine House Booklet with Plan-Set •••• This large format 24) 9½ʺ x 13ʺ page Booklet with over 70) illustrations detailing how to build a single stall Engine House with a Blacksmith Shop that was located in a northern Wisconsin Sawmill complex. 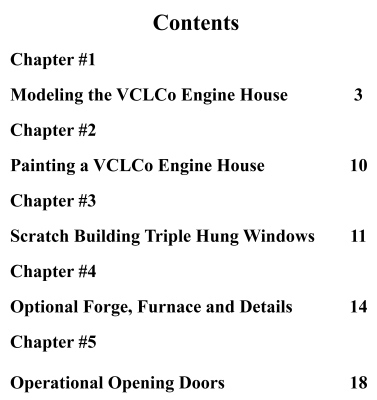 Chapters include painting and weathering, building Triple Hung Windows, detailing a Blacksmith Shop, operational opening Doors. Footprint 27⅜" x 7¾" (x 14¾" Shop). Plan-Set includes; 8) 13ʺ x 19ʺ Super B drawings. 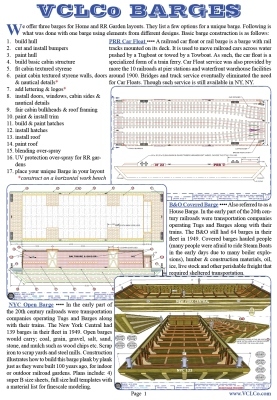 Building Large Scale Barges Booklet with or without Plan-Sets •••• This 16) 9½ʺ x 13ʺ page booklet with 35) construction illustrations and pictures on three different methods to build, three styles of barges for a garden pond or......................... Includes: VCLCo Rules for painting and weathering barges, text and drawings for a "Patented" Transfer Apron Float Bridge for loading rolling stock onto a Car Float Barge. 1. B&O Covered Barge Plan-Set includes; 7) 13" x 19ʺ super B drawings. 2. NYC Open Barge Plan-Set includes; 5) 13" x 19ʺ super B drawings. 3. 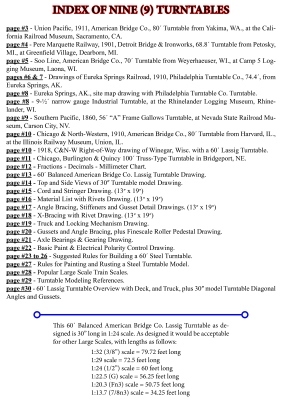 PRR Car Float Barge Plan-Set includes; 5) 13" x 19ʺ super B drawings. 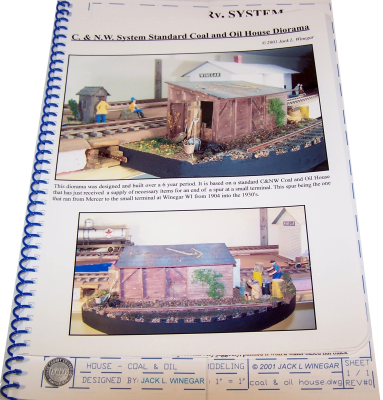 Bound Booklet with Plan sheet •••• Booklet consists of over 10) 8½ʺ x 11ʺ pages, over 20) illustrations, with a material list detailing on how this very detailed, award winning model was built. Plan sheet is 1) 13" x 19" super B size drawing. 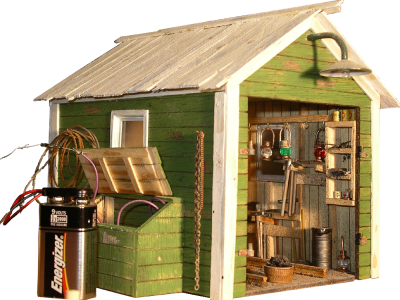 Tool House •••• This award winning model started as a kitbash of a readily available commercial kit. 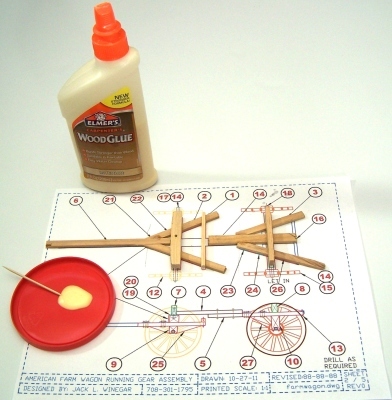 Drawing sheet includes every detailed dimensioned modifications made to this commercial kit, making a very unique model and diorama. Footprint is 5¾ʺ x 4⅞ʺ. Bound Booklet •••• Booklet consists of over 14) 8½ʺ x 11ʺ pages, with over 35) illustrations, and detailed instructions on weathering and scenicing for any diorama. This booklet instructions are a very detailed on how I kit bashed this commercial kit. Plan sheet is 1) 13" x 19" super B size drawing. Farm Town Prairie Skyscraper •••• Such Grain Elevators were found throughout all the farming areas in North America next to railroad tracks 100 years ago. They were known as Prairie Skyscraper's because they were taller than any other structure on Americas Great Plains. Farmer Co-Ops used these elevators to pool their grains for better pricing with the grain buyers. Grain buyers were notorious for undercutting individual farmers. Footprint 20¾ʺ x 15½ʺ. i Spiral Bound Booklet •••• This booklet consists of 20) 9½ʺ x 13ʺ pages to construct a Farm Town Grain Elevator. 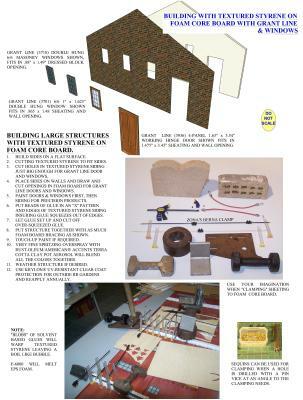 Booklet contains 8) foam core board construction photos, 16) vintage illustrations on prototypical construction, plus a material list for indoor or Railroad Gardens. Painting recommendations, construction photos, and an operation schematic. Plan-Set includes; 5) 13ʺ x 19ʺ super B drawings. We offer a Booklet describing how to use Foam Core Board, and textured styrene with commercial doors and windows for some of our buildings and your projects, priced at $15 with free shipping. 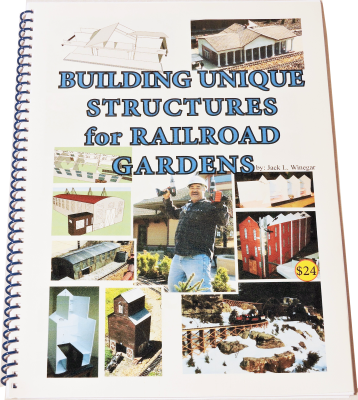 Booklet consists of 20) 9½" x 13" pages of acceptable materials, adhesives, and finishes with over 40) illustrations for Railroad Gardens and indoor layouts. 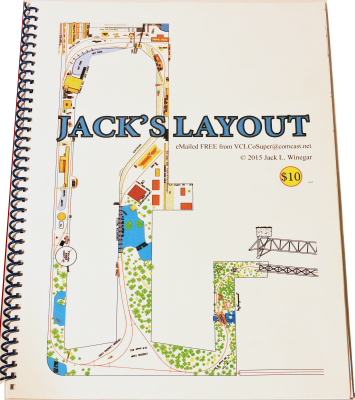 Jack's Shelf Layout Booklet •••• Booklet consists of 12) 9½ʺ x 13ʺ pages, with 20) illustrations and pictures on building a Large Scale shelf layout with hidden brackets and no duck-unders. Items covered in this booklet includes a drawing which can be used to fabricate these “no-see-em” brackets, high shelf layout stools, backdrop, Homasote® roadbed, rolling stock clearance. Printed copy mailed booklets include a “no-see-em” bracket on a 13ʺ x 19ʺ super B drawing. 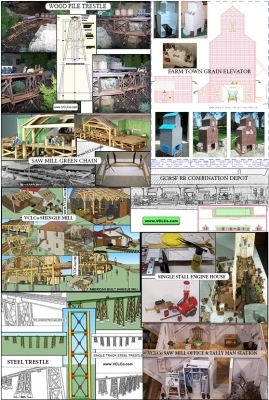 Building Unique Structures for Railroad Gardens and Indoor Layouts Booklet •••• This is more than a 48) 9½ʺ x 13ʺ page pictorial of Railroad Gardens because it includes over 150) illustrations and pictures of: Adhesives, Finishes, Large Scale Figures, and Materials for Railroad Gardens. 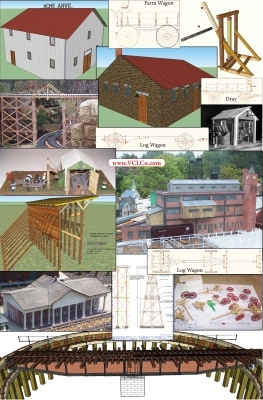 Building: Bridges, Trestles and Viaducts, Depots, Factories, Grain Elevators, Logging Cabins. 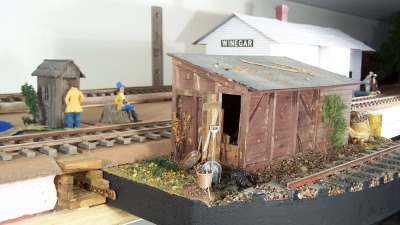 Track Stuff includes; HDPE Sub-Roadbed, Handcar Shed, Portal, Safety Platform, Set-Off, and a Turntable for a Railroad Garden. Quarry and Wharf vignette elements. Plus 5) dimensional structure plans. Velocipede Shed •••• This shed was fond everywhere along trackage about every 10 miles for Section Crews' Velocipedes (from the French for "swift footed") tools and parts across the North American continent to check and work on their section of track. 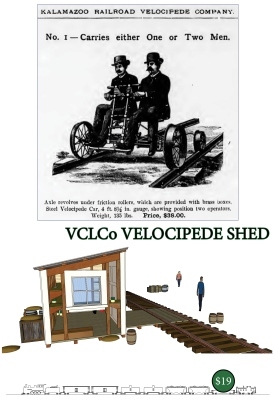 Velocipedes weighed around 135 pounds and were easily manhandled from planks between tracks onto a small platform in front of the shed and rolled into the building for protection from the weather. 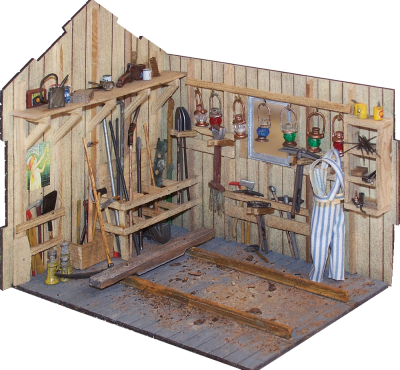 This model can be built very basically for a person with limited modeling experience or very detailed for the finescale modeler. Footprint is 4ʺ x 6ʺ. 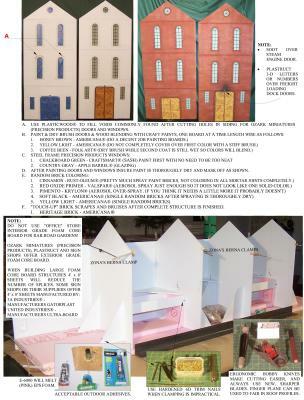 Deluxe Booklet with Plan-Set •••• The Plan-Set includes options of using foam core board, with cast or vacuum formed styrene doors and windows or the option for finescale stick styrene modeling. Deluxe Plan-Set includes; 5) 13" x 19" super B size drawings with material and detail options depending on options chosen and a simple Set-Off option. Booklet consists of 16) 9½ʺ x 13ʺ pages, with 25) illustrations and pictures, and scale conversions plus vintage Velocipede information. 1:24 (½ʺ) scale Snow Shed Booklet with Plan-Set •••• Every layout that represents trains going through Mountains needs a Snow Shed. Footprint as designed is 20¼ʺ x 44⅝ʺ in 1:24 scale. The length can easily be varied ± 4ʺ in 1:24 scale. Plan-Set illustrates how to vary the roof width depending on how close to the mountain your Snow Shed is built. 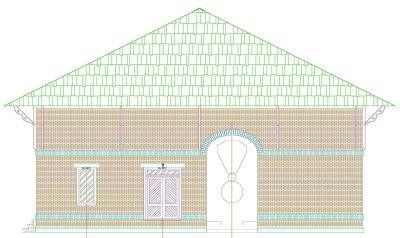 1:24 (½ʺ) scale Plan-Set & Booklet includes; 3) 13" x 19" super B size drawings with the profile shown in full scale. 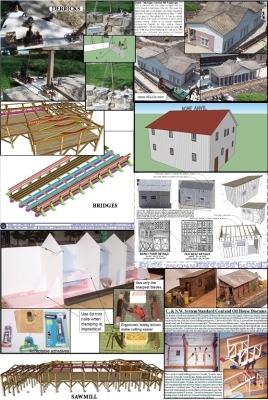 Booklet contains over 15) pictures and illustrations on 14) 9½ʺ x 13ʺ pages with construction instructions, photographs and weathering options. 1:48 (O) scale Plan-Set & Booklet includes; 2) 13" x 19" super B size drawings with the profile shown in full scale for and a 12) 9½ʺ x 13ʺ page booklet. Monon Freight House Depot •••• This construction booklet is based on the Monon Freight House which has been in Michigan City Indiana for over 150 years, and still there. 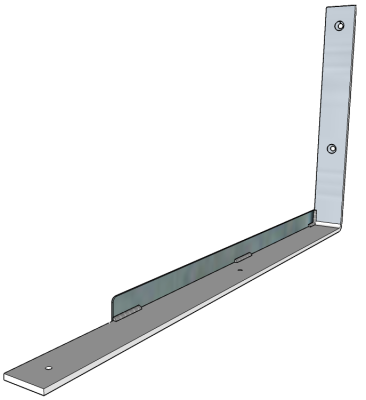 Footprint as designed is 100ʺ x 30ʺ with the length easily reduced in increments of 12ʺ or increased in 12" lengths to store trains out of the weather on of track in a RR Garden. 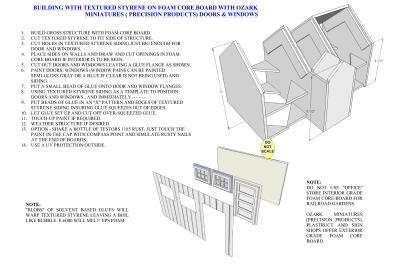 Delux Booklet with Plan-Set •••• The booklet contains; 14) 9½ʺ x 13ʺ pages, with over 35) illustrations for Foam Core Board construction and prototype photos. Materials, adhesives, and finishing for this model are covered. Plan-Set includes; 8) 13" x 19" super B size drawings. 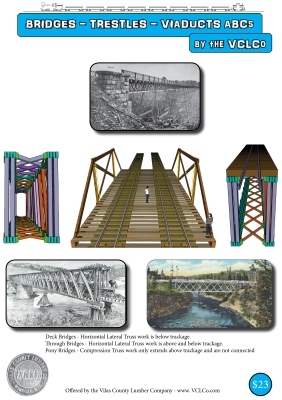 VCLCo Bridges, Trestles & Viaducts •••• This Booklet reviews the when, why and wherefore of Bridges, Trestles and Viaducts offered by the Vilas County Lumber Co. It will include illustrations on how different prototypical styles connected with different style piers. Plus painting, UV stabilization and weathering with no previous experience. 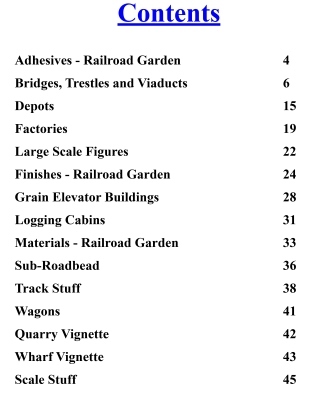 And, also information on acceptable outdoor railroad garden bridge materials and adhesives. Spiral Bound Booklet •••• The booklet contains; over 24) 9½ʺ x 13ʺ pages, with over 58) construction illustrations for Foam Core Board and prototype photos. Materials, adhesives, and finishing for this model are covered.